Opens the Microsoft Visual Basic editing window for writing and debugging VBA code (short for "visual basic for applications integrated development environment"). See the help files provided by Microsoft for Visual Basic. 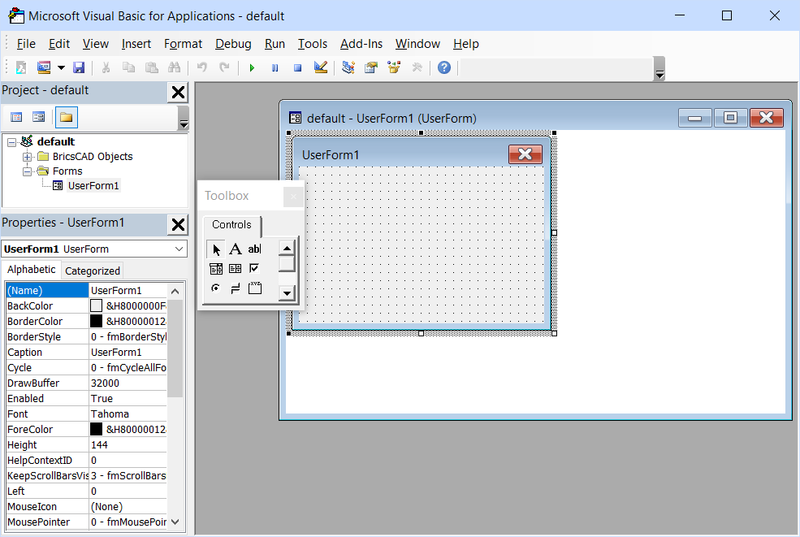 AddInMan - loads and unloads VBA functions through a dialog box. AppLoad - selects external routines to load when BricsCAD starts. Netload - loads a .NET application. VbaMan - manages VBA projects. VbaNew - starts a new VBA project. VbaRun and -VbaRun - runs VBA macros. VbaSecurity - depending on the selected security level (Low, Medium or High) VBA macros are allowed to run automatically or not. VbaUnload - unloads VBA projects.